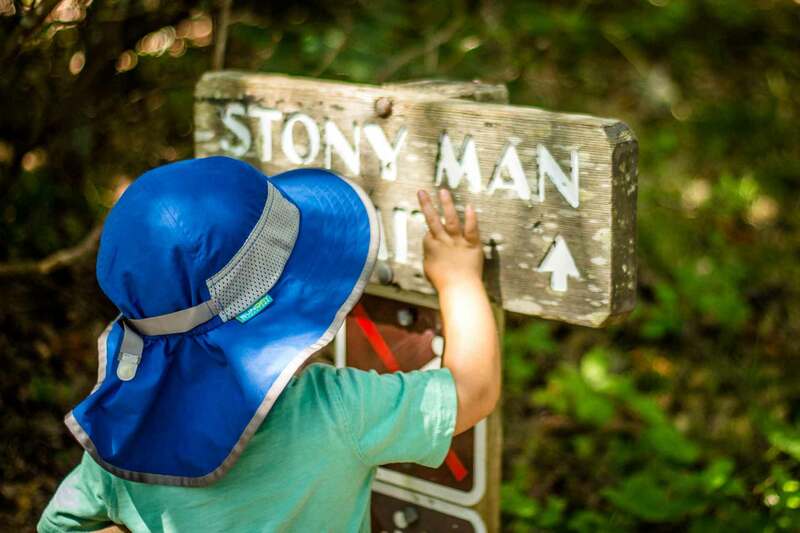 Our first hike within the park was the Stony Man trail, which was recommended to us by a ranger at the Harry F. Byrd Sr. Visitors Center. The trailhead is found in the northern Skyland parking lot (there are two Skyland parking lots). 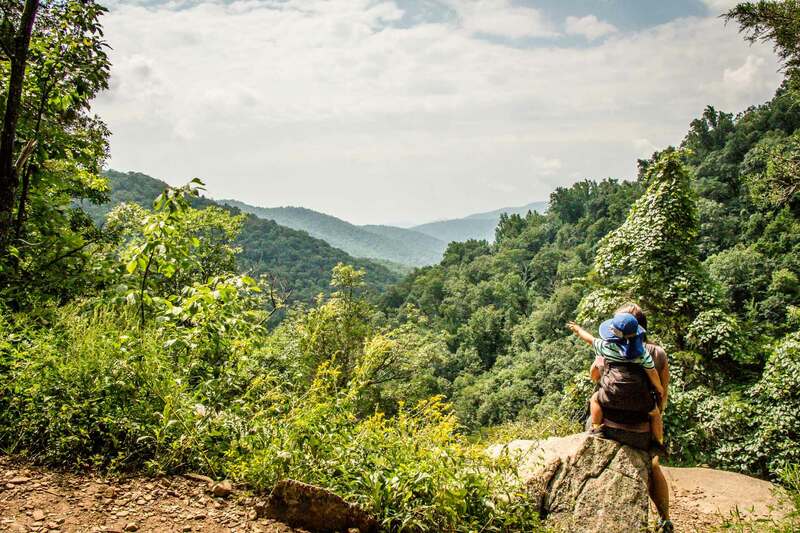 The hike begins along the Appalachian Trail, which is pretty cool. 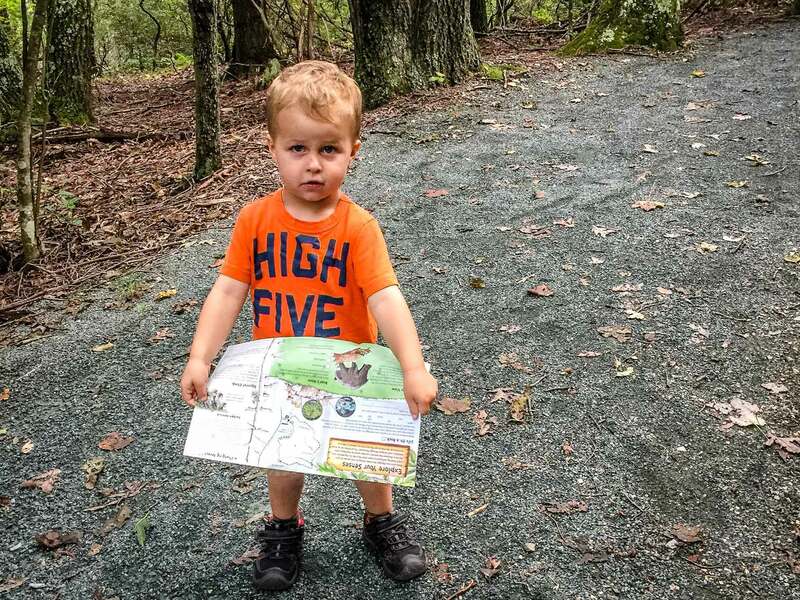 The hiking trail is good for a family walk as it’s wide enough for two people in most spots. The forest is thick enough that it blocks most of the direct sunlight, making it a good choice for a hot day. It’s a slow, but steady climb upwards through dense forest for the first 0.6 miles (1km), at which point the trail forks. You can choose either path as the trail becomes a loop at this stage. It’s not long before the loop diverts to a path which leads to a stunning viewpoint. 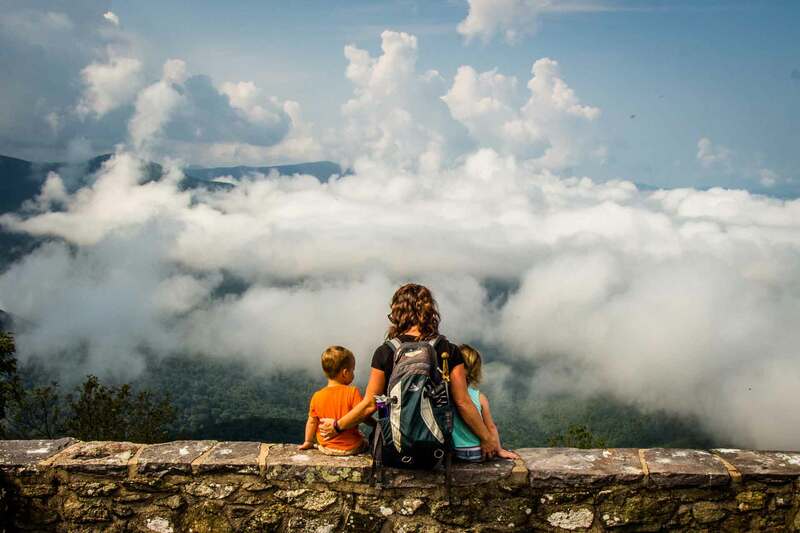 The viewpoint looks west allowing a fantastic view of the Blue Ridge Mountains for as far as the eye can see. 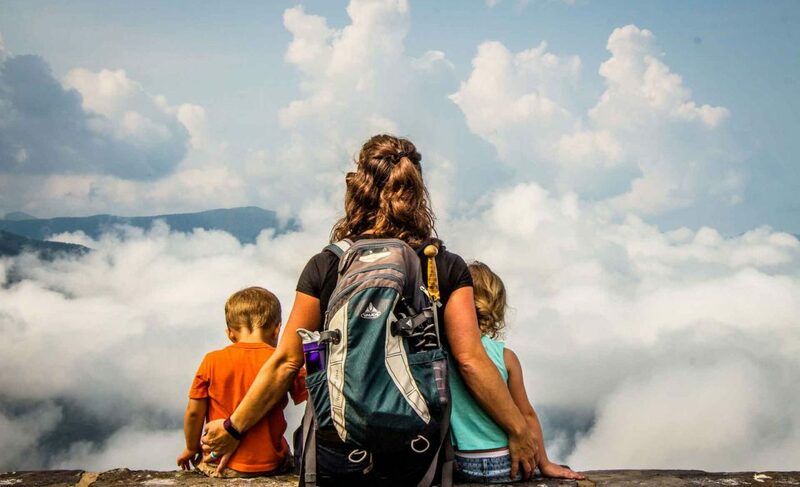 Watch your little ones closely as the viewpoint is on a large rocky outcrop with no safety rails, the rocks are uneven and due to the popularity of the hike, is often crowded. On the way back down we came across a large group of people stopped on the trail. They were watching a mother black bear and her small cub about 30 feet from the path. We stayed and watched the bear for a while as we had the safety of a large group and the mother bear did not seem disturbed by our presence at all. We kept our kids very close though just in case. Once the group got too small, we got on our way as well. The entire Stony Man hike wasn’t very long coming in at 1.6 miles (2.6km). We let the kids walk the whole thing, and they had a great time looking at all the bugs and butterflies. We tried hard to keep them on the trails as it appeared that there was poison ivy in the trailside bushes. Given the kids walked the whole thing, the hike took much longer than it should have, clocking in at 2h05m. After the first hike we drove back to the Visitor’s Center to freshen up and buy a few cookies as a reward for a good hike. We then drove a few minutes to the Dark Hollow Falls Trail. 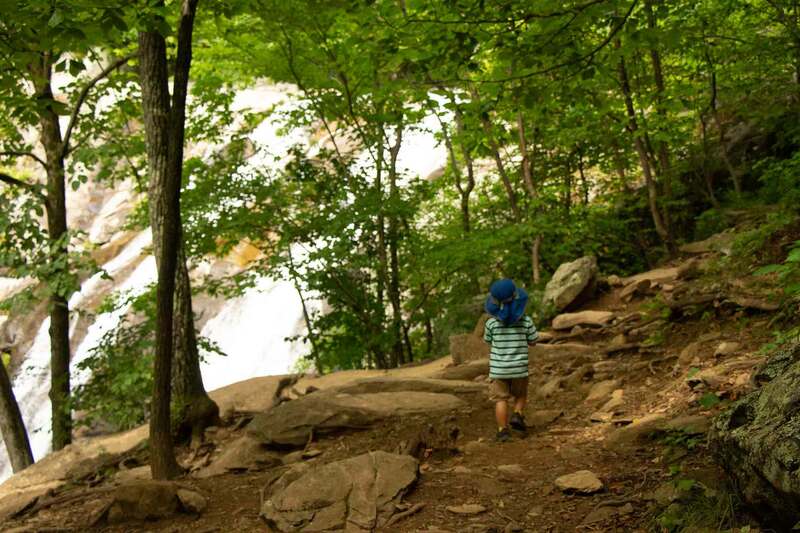 This is a short, but very popular family hike which leads to a beautiful, tall waterfall. The hike is pretty interesting in that the first half is all downhill, which is great as kids typically hike very well when it’s easy. 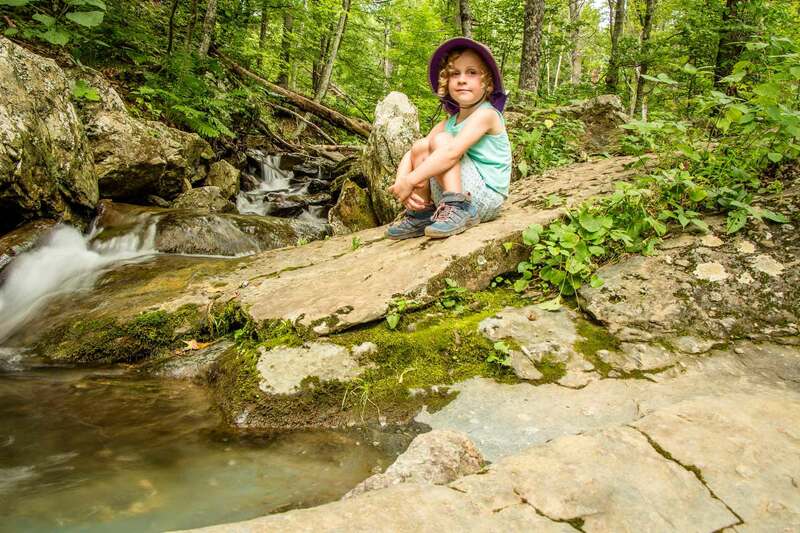 The trail follows a mountain stream all the way down, providing lots of excellent bonus nature sounds and scenery. 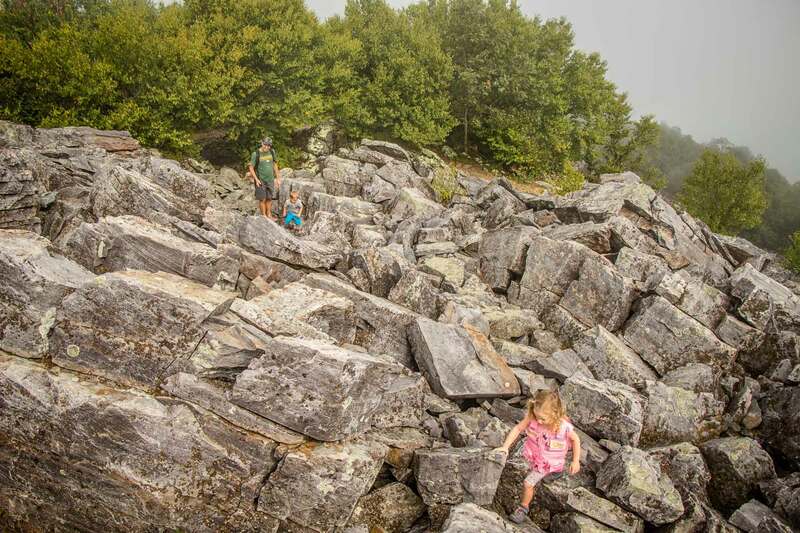 Along most of the trail is a short rock ledge, which proved to be irresistible to our kids. They wanted to walk the whole way down on top of this little ledge, which was mostly ok, but it did slow them down and it wasn’t in great shape in a few spots, so we needed to watch them pretty close. The trail descends for just over 0.6 miles (1km) until you get to the bottom of the waterfall, which really is quite beautiful. There is a small landing at the bottom where people jockey for position to get a good picture of the falls. Get your picture too, but try to take a few moments to just stand and appreciate it before beginning the climb back up. Our 2 year old was getting cranky, so we put him in his carrier for the walk back up to the top. We know from experience that he could have handled this relatively easy walk back up, but he just wasn’t in the mood. Our 5 year old daughter walked 2/3 the way up before convincing us to carry her. She also could have easily done it, but she doesn’t seem to like doing all the hard work when her little brother doesn’t have to. The Dark Hollow Falls Trail hike was 1.6 miles (2.6km) in total. It took us about an hour to descend as the kids set the pace, but with the little guy in a carrier on the way up, it took us about half the time as the descent. This was a short, fun hike with good scenery along the way and a great payoff at the end. Definitely worth the time! We saw another black bear on the side of the highway on our way back to our Airbnb. 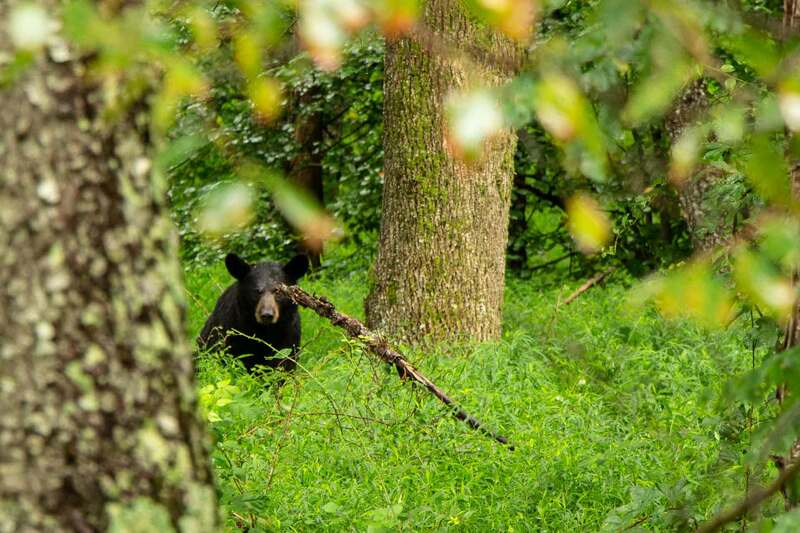 We love black bears and have never had an issue with them. They are beautiful and peaceful animals, but they are large wild animals, so can be unpredictable and dangerous. 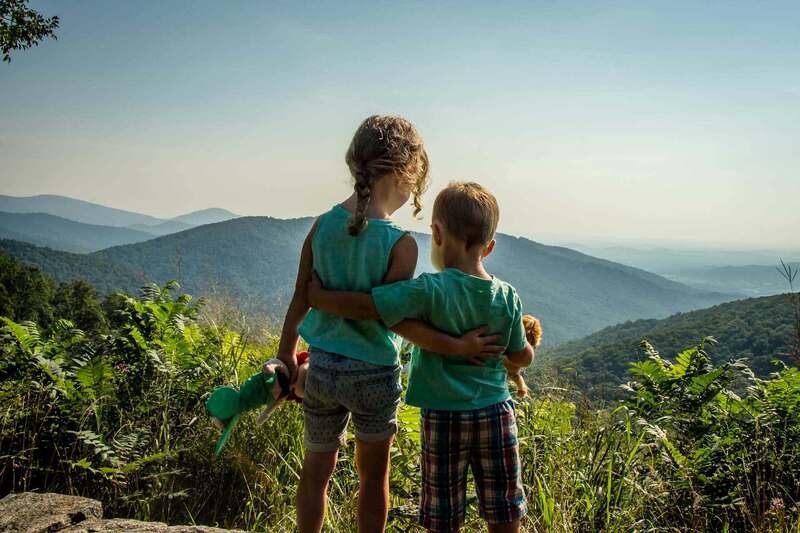 There seems to be plenty of bears in the park, so it’s best to brush up on your bear safety before taking your kids for a hike. 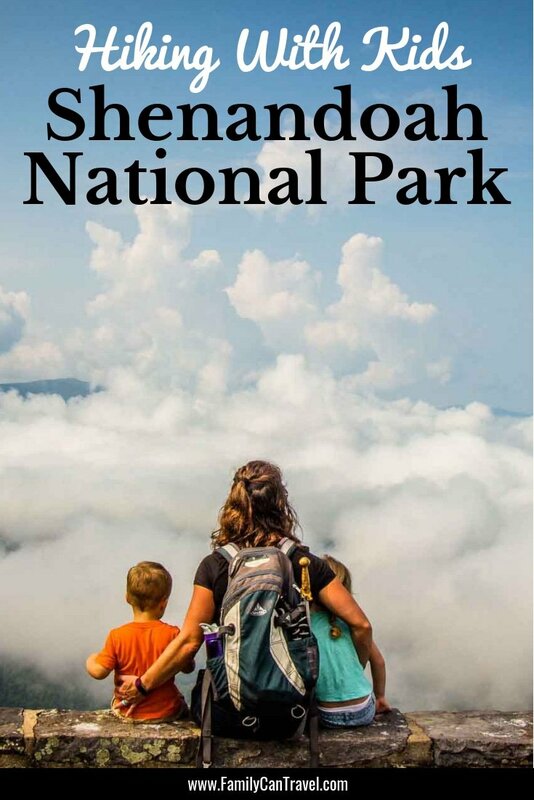 This is one of the most popular hikes in Shenandoah NP and we weren’t surprised when the free national park parking lot was almost full when we arrived around 8:45am. (There are many private homeowners nearby who charge $10 for overflow parking). There is a ticket booth at the trailhead where you can buy a national park pass, but given we had already purchased a 7 day pass, we were able to show our receipt and head on our way. The Whiteoak Canyon Trail is very beautiful. It follows the Robinson River the whole way to the top, treating us with several large waterfalls along the way ranging in height from 35′ to 86′. There are lots of little swimming holes and smaller waterfalls along the way as well. 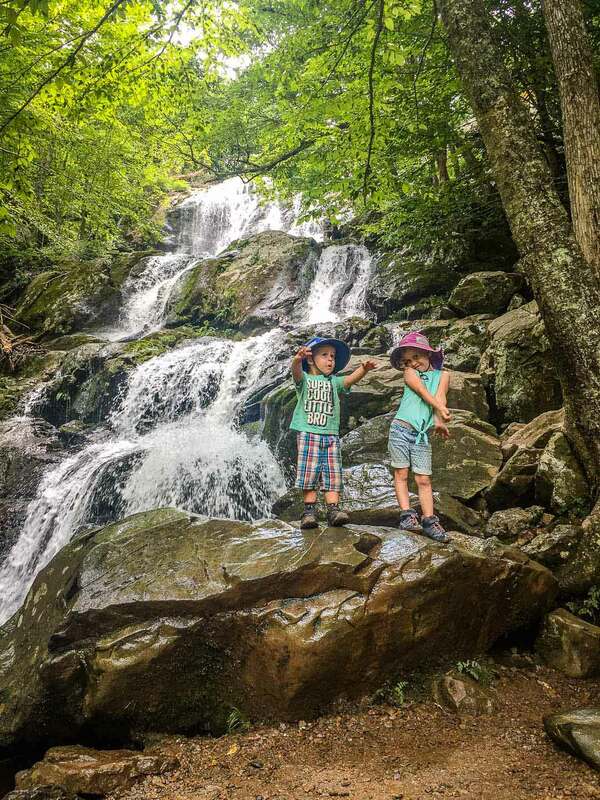 Our kids had a ton of fun on this hike and were able to walk all the way to the first waterfall by themselves. They actually walked at a good pace, but there was so much amazing nature to distract them that it took us quite a while. Our kids stopped to look at all the acorns, mushrooms, butterflies, daddy long legs and tiny lizards along the way. Oh ya, they also picked up every single caterpillar they found as well and wouldn’t start hiking again until they made it a nice little home made out of leaves and twigs on the side of the trail – haha! 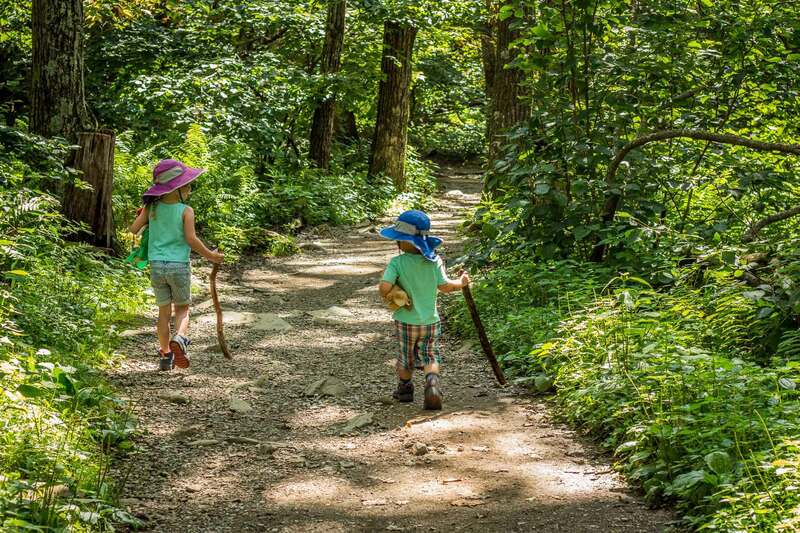 It’s sometimes frustrating waiting for the kids when we have hiking goals to achieve, but it’s also gratifying to see them learn to love nature so much. In fact, given our 5 year old daughter’s love for insects, etc., we bought her a bug viewer at the visitor’s center and she LOVED it! The full Whiteoak Canyon Trail stretches from the parking lot on the valley floor to the Skyline Drive at the very top of the park. The full distance is approximately 4.6 miles (7.6km) one-way and comes with a whopping 2400 feet (734m) of elevation gain. 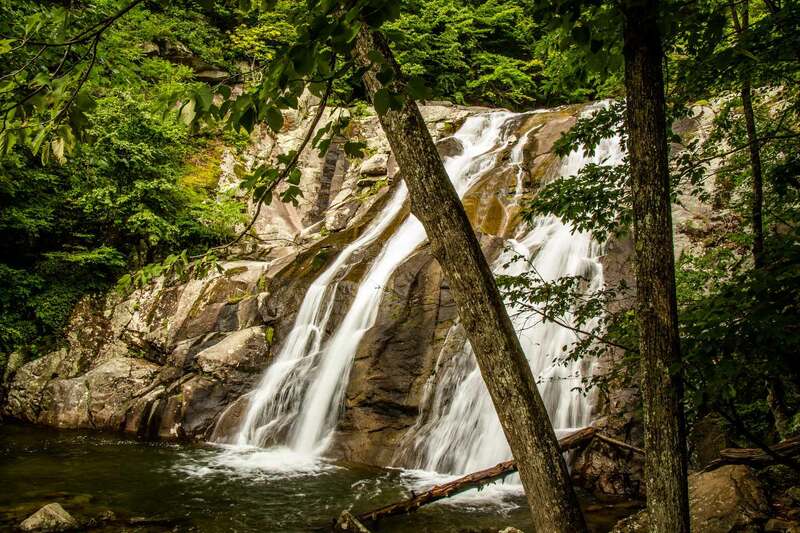 Most people will only hike from the lower parking lot to the first waterfall, which is approximately 1.6 miles (2.5km) one-way and only about 390 feet (120m) of elevation gain. After it took so long to get to the first waterfall, we put the kids in their carriers and tried to make some good time to the upper falls. We ended up hiking to the second visible waterfall, about 2.5 miles (4km) into the hike and about 1030feet (315m) elevation gain before we turned around. We had originally hoped to hike all the way to the highest waterfall (which wasn’t much further up the trail), but the hike to this point had taken us significantly longer than we had originally planned. It was already lunch time and we had planned on being back at our Airbnb for lunch, so without enough food in our bags to keep our legs moving and the kids from getting hangry, we turned back for the car. 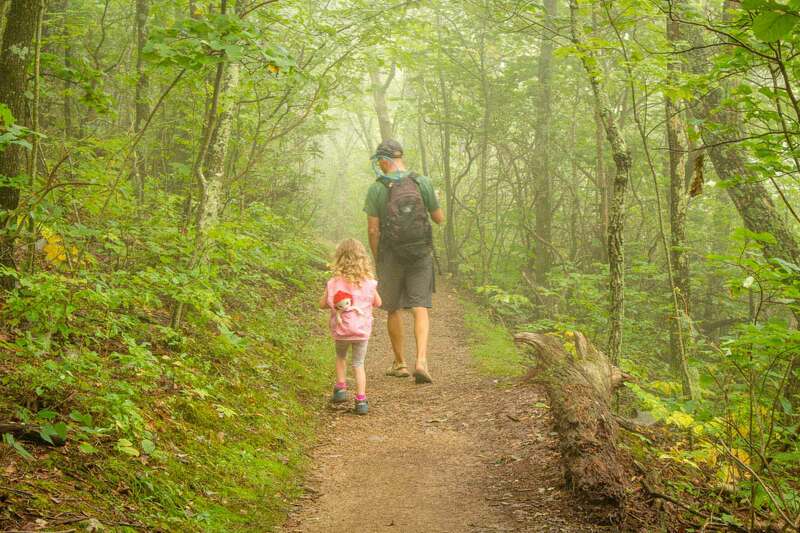 It’s worth noting that the Whiteoak Canyon Trail hike will probably take you longer than you think as well – the footing on the trail is often quite challenging, with many rocks and tree roots to contend with. Make sure everyone has proper footwear on. 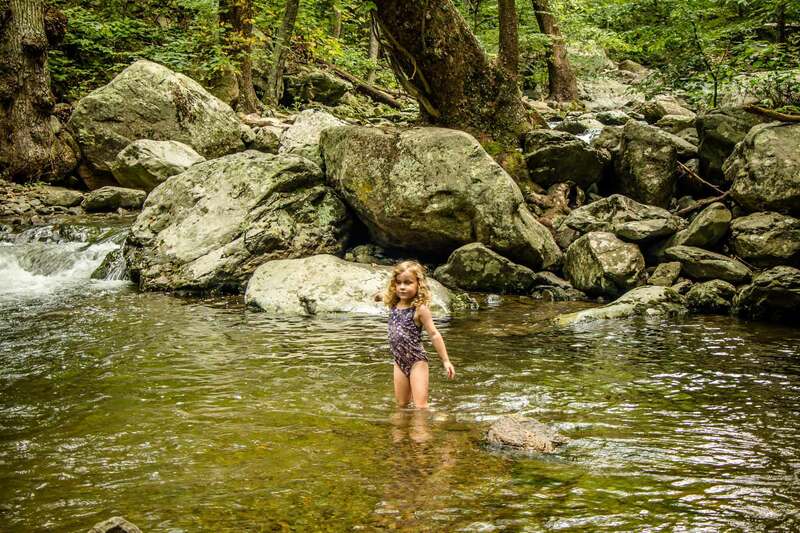 On the way back down, we stopped at one of the many little natural wading pools to let the kids play in the water. We had promised them we’d stop on the way back down, so we couldn’t renege on the promise. We had brought their bathing suits, so we got them changed and let them splash around and throw rocks for a little while. It was a great way to great way to refresh their energy levels on a hot day of hiking! Given it starts at the top of a mountain ridge, the Millers Head Trail naturally descends the whole way to the lookout. 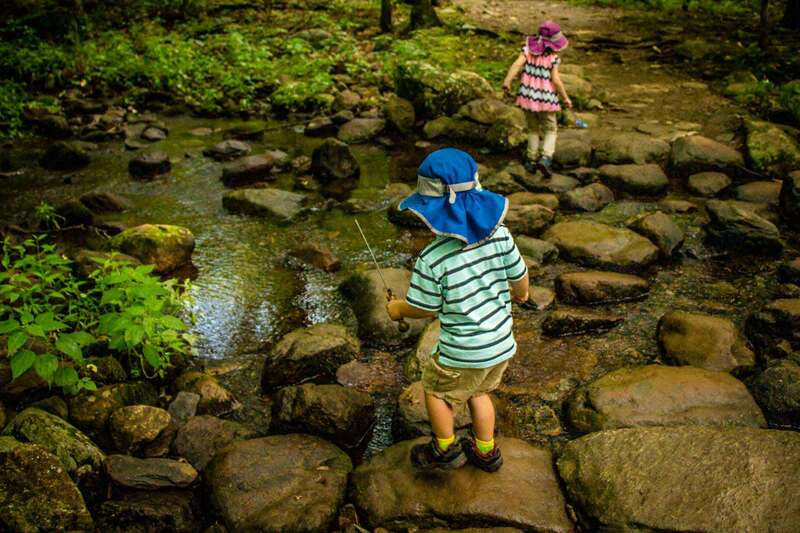 This is great for hiking with kids as they will love the effortless movement down the trail. Of course, all the nature goodies will stop them along the way. There were tons of millipedes all along the trail, as well as caterpillars, butterflies and we even found a little brown tree frog. The trail is good quality, but there are still rocks and tree roots, so good shoes are a must. After 0.8 miles (1.3km), the trail ends at a lookout structure with high cement walls on all sides. The views of the valley below and mountains in the distance are breathtaking. Given the height of the walls you’ll need to lift your kids up to see, otherwise expect them to get restless in a hurry. There’s a big drop-off, so hold them tight. Of course, what goes down must come back up, so you’ll need to make the trek back up to the parking lot. 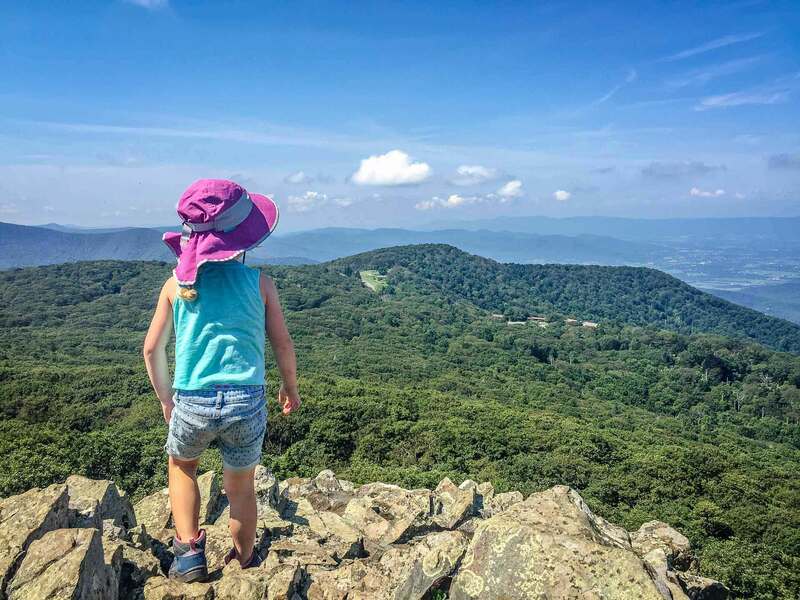 Don’t worry, our kids were able to hike the whole way up without issue, so if you and your kids are in reasonable shape, you’ll be ok.
Next we drove south along Skyline Drive a few minutes to the Limberlost trailhead. Limberlost is a super easy 1.3 mile (2.1km) hike through a well-treed, flat section of the national park. The manicured gravel pathway is even stroller friendly. The moment we set foot on the trail it started to rain. We didn’t have any of our rain gear with us, but the path looked well treed and it was a reasonably short hike, so we decided to risk it and walk the loop anyways. Our risk paid off for the first half – it wasn’t raining too hard and the tree canopy was offering some relief from the rain. But the rain really started to pour in the second half and we got soaked! This turned out to be the start of a large storm which produced many flash flood warnings for the area. We finished the 1.3 mile (2.1km) Limberlost loop in less than 45 minutes, which is half the time that distance usually takes us. We did the hike so fast that I don’t really have much commentary, except for the fact that it’s super easy and child friendly. Our daughter ran the whole distance and our little guy could have too, except we picked him up for speed when it started to rain hard. It was pretty foggy as we drove south on Skyline Drive towards Blackrock Summit. Given the payoff of this hike was a viewpoint, we weren’t sure if we should even bother with the hike. As we pulled into the parking lot, the fog was still very thick, but it wasn’t raining or cold, so we decided to give the hike a shot anyway. Hiking in the fog in the forest is one of my favorite things – it’s so spooky! 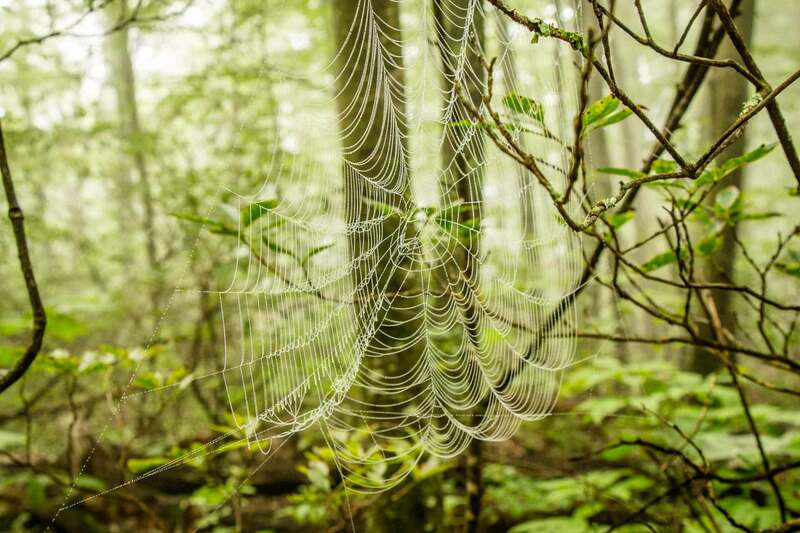 One of the most interesting things about the hike was the fog had created condensation on all the spider webs, making them sparkle and glisten. The strangely beautiful spider webs were seemingly everywhere in the trees and bushes and we had a lot of fun admiring the patterns. 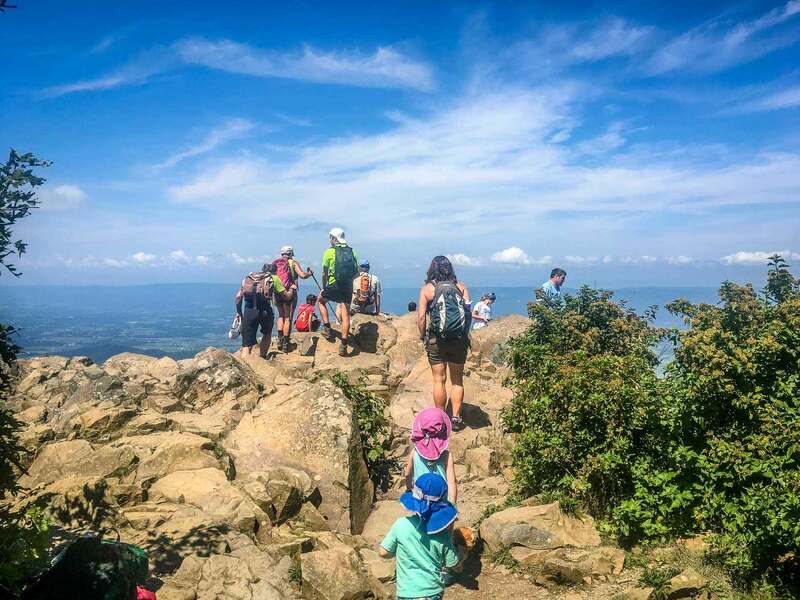 The Blackrock Summit hike itself is quite easy; it’s a 1.2 mile (2km) loop which partly follows a section of the Appalachian Trail. There’s a bit of an incline (200feet / 61m in total elevation change), but it’s very manageable for anyone in reasonable shape. 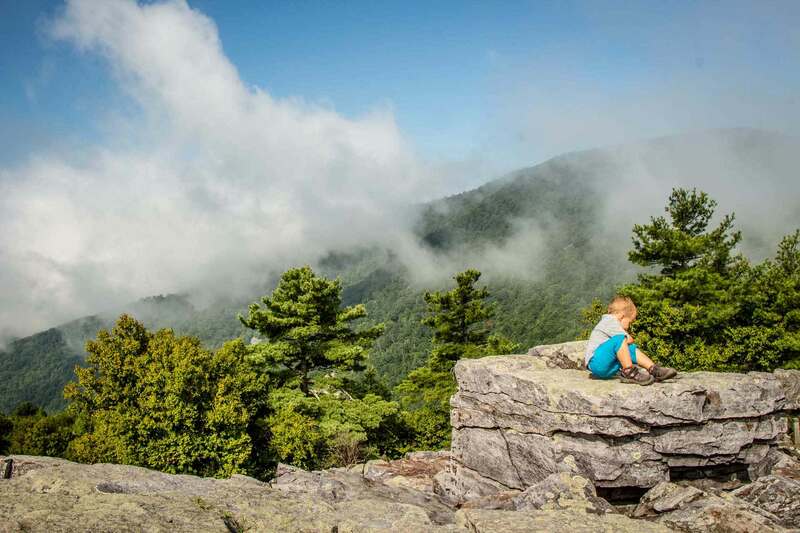 When you reach the Blackrock Summit, the trail wraps around a pile of large rocks which you can climb to get the best views of the valley and surrounding mountains. The rocks are quite big, so you may need to help small kids get to the top. As for the view, the fog miraculously lifted just as we reached the Blackrock Summit. We believe that it’s always worth trying a hike in the fog just in case, and this time it paid off. Truthfully, it would have been an enjoyable hike even without the views, but the views made it that much better! 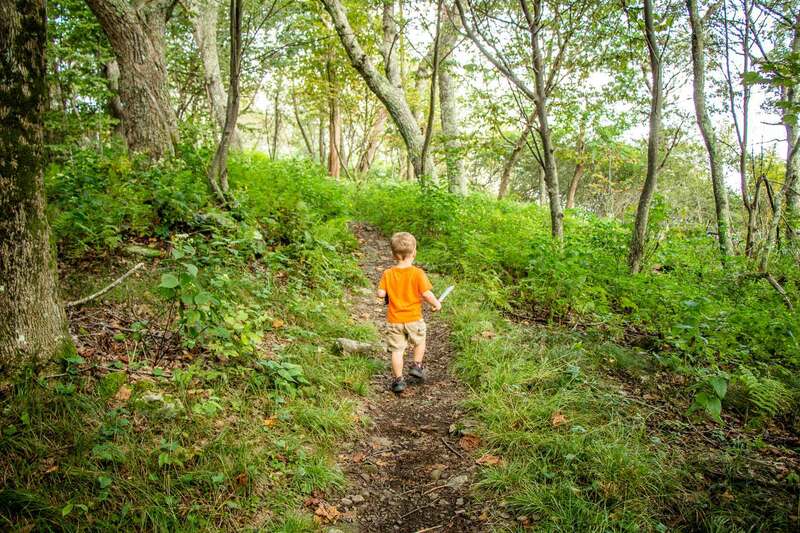 Share other kid-friendly hikes in Shenandoah NP in the comments below!